This once great Halloween attraction, with its foggy seaside atmosphere, suffered from diminishing returns when it expanding to two mazes in 2008. Since the death of owner Bob Koritzke in 2009, it is no longer in operation, its assets having been sold off to the Haunted Queen Mary. Was Seaside Haunted Theme Park your favorite way to spend Halloween in Los Angeles? Vote for it in our online poll. 2009 SEASIDE HAUNTED THEME PARK NEWS: This haunt will not be in operation following the death of co-owner Bob Koritzke in July of 2009. The old website URL was reassigned, pointing to an advertisement for the Queen Mary Shipwreck's annual Halloween TerrorFest. All information on this page is from 2006-2008. SEASIDE HAUNTED THEME PARK HOURS: Sundays & Weekdays 7:00pm to 10:00pm (last ticket sold); Fridays, Saturdays & Halloween 7:00pm to midnight (last ticket sold). SEASIDE HAUNTED THEME PARK TICKETS: $13.50 for one attraction; $18.50 for both attractions. $20 for VIP Tickets (both attractions, private entrance); $10.00 for children's matinees. SEASIDE HAUNTED THEME PARK DISCOUNTS: Group discounts - ten or more - $2 off regular ticket or VIP; available at box office only. SEASIDE HAUNTED THEME PARK PLATINUM PASS: Purchase this discount pass for $39. It grants admission to Old Town Haunt, Seaside Haunt, Spooky House, and Fearplex through the Halloween season (one admission per haunt only). Tickets available only in advance. SEASIDE HAUNTED THEME PARK DISCOUNTS: The official website does not mention group discounts available; however, you can e-mail your request for a discount coupon by going to this page. 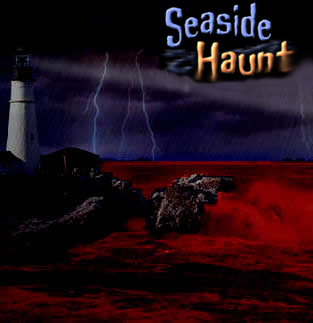 SEASIDE HAUNT HISTORY: This Halloween attraction made its debut in 2005 under the name "Seaside Haunt," which offered a single elaborately decorated maze based on a "true" legend of a light house operator who turned off the light from time to time, causing ships to crash; supposedly, he disappeared without a trace and was haunting the lighthouse. This was one of the best single mazes we had ever seen -- filled with enthusiastic ghouls eager to scare the customers. In 2008, the original proprietors left Seaside Haunt to create a new Halloween attraction, Skull Kingdom in Woodland Hills. Under new management, Seaside Haunt changed its name to Seaside Haunted Theme Park and expanded to feature two mazes: Mutiny to Purgatory - climb aboard a ship filled with zombie pirates; Blood Beach Haunted Mansion - a haunted house overlooking the sea cliffs, with over 20 haunted rooms. SEASIDE HAUNTED THEME PARK FEATURES: There are a few tens/kiosks offering snacks and/or souvenirs. Near the entrance there is a tent where you can have a psychic reading. SEASIDE HAUNTED THEME PARK DRAWBACKS; You have to make the long drive out to Ventura, but that pays off in terms of the extra added atmosphere afforded by proximity to the ocean. Once you are done with the maze, there is little else to do in the Seaside Park, but a few blocks drive will take you into the heart of Ventura, where there are many places to grab a bite to eat. NOTE: Although there has been talk of changing location in the hope of attracting greater business, Seaside Haunted Theme Park remain in its familiar Ventura location. Please make the trip out there this year - we guarantee you'll be glad you did! RELATED HAUNTS: Before his untimely death, Seaside Hauntwas under the aegis of Bob Koritzke, who also owned or co-owned Spooky House , Fearplex, Old Town Haunt , and Skull Kingdom. Old Town Haunt will operate in 2009, but Fearplex apparently will not. Spooky House will be under new management, incorporated into the Queen Mary Terror Fest. Check our our archive of articles for Seaside Haunt.